It’s the beginning of a new year, which means the Internal Revenue Service has published a new standard business mileage rate. For 2017, the IRS “Safe Harbor” rate has been set at 53.5¢ per mile driven for business purposes, down a half-cent from last year’s rate. Abacus has already been updated to reflect the new rate, so no action is necessary on your part. Unless you’ve replaced the government’s suggested rate with your own, this is what you’ll see in your Abacus Expense Policy. Along with the business-use rate, the IRS has recommended 17¢ per mile for medical or moving purposes (down 2¢ from last year) and 14¢ for charitable purposes. The new rates mean businesses are going to deduct slightly less in automotive costs than they did in 2016, while employees will be reimbursed less. It’s small change, but if a company spends a lot on mobile employees, that could add up. Did the IRS get this wrong? The decrease comes at an odd time. With this rate update, the government is essentially predicting that owning and operating a car will cost about 1% less this year than it did last year. But that projection flies in the face of economic headwinds going the other direction. Here in January 2017, the costs of both fuel and vehicle maintenance are going up. Strong wage growth and expectations of expansionary fiscal policy suggest 2017 might be the year inflation finally becomes an issue. The Fed raised rates last month, with two or three more hikes expected this year, and analysts still fear it acted too late to avoid inflation. In other words, these are not the conditions in which consumer costs are typically expected to go down. So why is the IRS advising precisely that? The answer is twofold. In one sense, their strange prediction seems to be an accident of timing. More generally, it exemplifies the pitfalls of analyzing financial signals infrequently — and, conversely, the value that analysts gain by generating business insights in real time. Why does the IRS standard mileage rate change? The IRS Safe Harbor rate is a benchmark designed to help taxpayers report their mileage deductions. It is the amount per mile a business can deduct tax-free with no questions asked, as long as they provide a mileage log. It makes life easier for the IRS and the taxpayer. While the IRS doesn’t intend for their mileage rate to exactly reflect the cost of operating a car, it can’t be too far off. If it’s too low, businesses will spend money and effort using an itemized deduction; too generous, and the government gives up tax dollars. To strike a happy medium, the IRS uses the research and recommendation of a third-party analyst to predict the average cost of owning and using an auto for the next calendar year. The problem is, this is a borderline impossible projection to make. Of all the expenses of owning and operating a vehicle, relatively few are fixed. 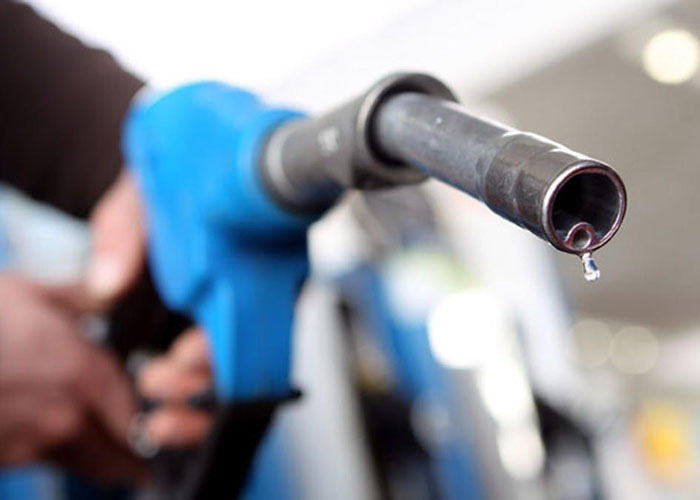 Most of the costs factored into the IRS rate are variable, including a particularly heavy weight given to one of the most volatile goods on the planet: fuel. The average national price of unleaded gas is the single most determinative component of the Safe Harbor rate. At first glance, one appears to track the other quite well. But this approach is misleading. The above graph, which represents the IRS’s thinking, is based on spot price calculations. Not surprisingly, the mileage rate is close to actual vehicle costs when it’s published. But as prices change, and the IRS rate doesn’t, wild fluctuations in the actual cost of driving a vehicle go unreflected. Except for four occasions in the past two decades when the agency issued mid-year corrections, each year-long rate passively witnessed big, meaningful swings in the actual price of gas, bringing it in and out of touch with reality. Here’s a more accurate picture. As you can see, some years were OK; the rate ended up close to the actual 12-month average. In other years, not so much. Here’s a more detailed look at 2014-15, to take one example. Not even close! They’re almost negatively correlated. Being this far off has a real impact on businesses. In a year like 2014, finance teams either spent extra resources logging costs to prove a higher deduction than the Safe Harbor rate, or they deducted far less than they actually spent. In 2015, they may have paid drivers a lot more than they needed to. How could the IRS be so off? The answer lies in how they calculate the rate, and in the fallacy of static business projections themselves. 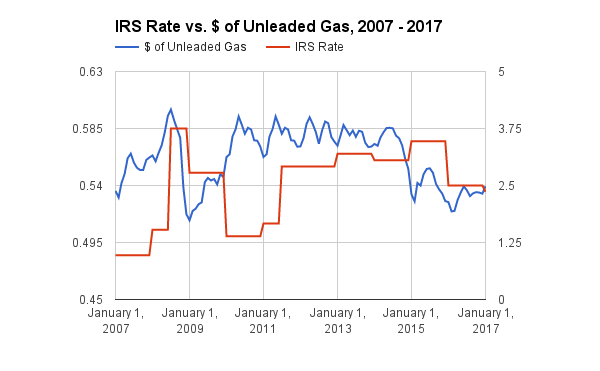 According to the agency, “The IRS normally updates the mileage rate once a year in the fall for the next calendar year.” Which means they and their third-party partner were projecting gas prices for 2017 around October and November of 2016 — most likely no later than Thanksgiving. How might we guess that timeline? Take a look at the price of gas over the last three months. Notice that crater around November 28 and the skyward ascent after? That was the inflection point when a year of historically cheap gas reversed. The uptick came hours before OPEC surprised the world by announcing a drastic cutback in oil production on November 30, and days before a separate trade group announced global oil demand would exceed supply in the first half of 2017, sending prices even higher. But these earthquakes in the oil market happened to occur a mere two weeks before the IRS was set to announce their new mileage rate. Did the agency look at the shifting tides and feel it was too late to complicate their computations with new data? If they did, it would explain why the IRS made a projection so contrary to what conditions indicated. On December 13, the IRS published a Safe Harbor rate that suggested things were about to get cheaper for American consumers. The very next day, the Federal Reserve committed to precisely the opposite judgment by raising rates for the second time in a decade. No one today is confused about which of those turned out to be the better bet: the Fed is already facing pressure to confront rising prices again, while this year’s gas prices are being projected to rise higher and higher each week. 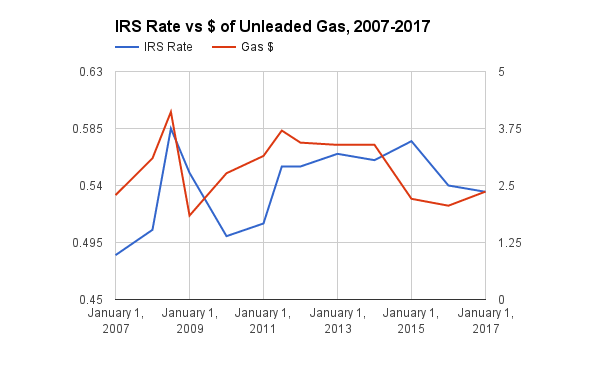 Most mystifying of all, the IRS’s rationale for predicting a small decrease in vehicle costs was that drastically falling gas prices “were largely offset by rising vehicle insurance and maintenance costs.” In other words, they would have projected an even bigger decrease in vehicle costs, except non-fuel costs were getting more expensive. Assuming they’re right about at least that analysis, that means as of now, every cost of vehicle operation is rising. In light of all this, the IRS’s projection of a cost decrease makes no sense. It probably made sense a few months ago, but since then, a lot of important factors have changed. Clearly, the Safe Harbor rate didn’t change with them. Given that the mileage deduction rate is already looking like a dud, 2017 may witness a rare mid-year correction by the IRS, which would be only their third in a decade. If that happens, you won’t need to work around the standard rate with automated mileage tracking software or alternative business vehicle programs in order to claim your rightful deduction. But there’s a bigger problem here. 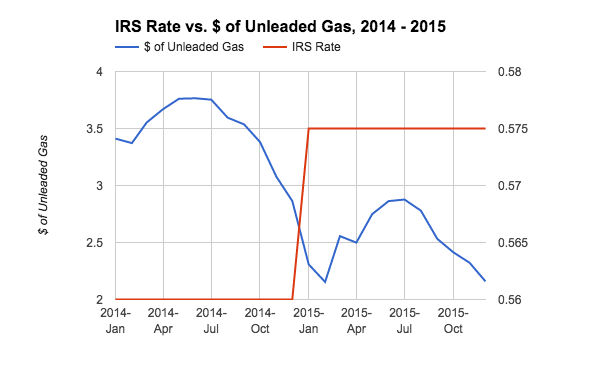 Even if they do change course in July, the IRS will eventually encounter woefully inaccurate mileage rates again. That’s the hazard with any inflexible financial projection. When information needs to be timely and you use static data, calculations become inaccurate fast. The only way to avoid making the IRS’s mistake with your own financial modeling is to gather data, generate insights, and make operational adjustments in real time. That means evolving your models right alongside dynamic conditions — not waiting seven months to fix them, like Uncle Sam.